When we consider modern American animal advocacy, we often think of veganism, no-kill shelters, Internet campaigns against trophy hunting, or celebrities declaring that they would “rather go naked” than wear fur. Contemporary critics readily dismiss animal protectionism as a modern secular movement that privileges animals over people. Yet the movement’s roots are deeply tied to the nation’s history of religious revivalism and social reform. 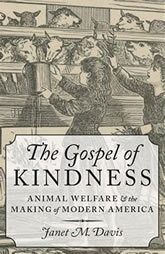 In The Gospel of Kindness, Janet M. Davis explores the broad cultural and social influence of the American animal welfare movement at home and overseas from the Second Great Awakening to the Second World War. Dedicated primarily to laboring animals at its inception in an animal-powered world, the movement eventually included virtually all areas of human and animal interaction. Embracing animals as brethren through biblical concepts of stewardship, a diverse coalition of temperance groups, teachers, Protestant missionaries, religious leaders, civil rights activists, policy makers, and anti-imperialists forged an expansive transnational “gospel of kindness,” which defined animal mercy as a signature American value. Their interpretation of this “gospel” extended beyond the New Testament to preach kindness as a secular and spiritual truth. As a cultural product of antebellum revivalism, reform, and the rights revolution of the Civil War era, animal kindness became a barometer of free moral agency, higher civilization, and assimilation. Yet given the cultural, economic, racial, and ethnic diversity of the United States, its empire, and other countries of contact, standards of kindness and cruelty were culturally contingent and potentially controversial. Diverse constituents defended specific animal practices, such as cockfighting, bullfighting, songbird consumption, and kosher slaughter, as inviolate cultural traditions that reinforced their right to self-determination. Ultimately, American animal advocacy became a powerful humanitarian ideal, a touchstone of inclusion and national belonging at home and abroad that endures to this day.